This is a gaffe comparable to Hillary saying they were “dead broke” upon leaving the White House. Bill Clinton made $105 million dollars in speaking fees between 2001 and 2013. He should have put aside enough money to pay their bills. Clinton also said, “I’m not in politics. 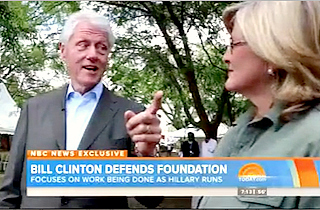 All I’m saying is the idea that there’s one set of rules for us and another set for everybody else is true.” First of all, Bill should consider the ethical standards politicians are held to avoid conflicts of interest when his wife is a candidate for president, regardless of whether he personally is in politics. Secondly, there is a different set of rules for the Clintons. They are ignoring the rules which other politicians follow. Clinton said, “we’re going to come as close as we can during her presidential campaign to following the rules we followed when she became secretary of state.” The problem is that they did not follow the rules when Hillary was Secretary of State. Two rules were present to avoid conflicts of interest and the appearance of influence peddling which Clinton is now accused of. Hillary Clinton was supposed to archive her email on government servers and signed a written agreement to release the identities of all donors to the Foundation. We now know that Clinton did not follow the regulations in effect as of taking office regarding email, and she failed to identify the donors. These are revelations which would have ended most political campaigns, except that the Clintons are not held to the same rules as everyone else. The internet has changed things quite a bit since Bill was in the White House. Interviews are analyzed by many people for accuracy. A lot of information is easily available. Bill’s comments will be fact-checked, just like the fact-checkers analyzed Hillary’s press conference regarding her email, and found that she was not telling the truth. As Hillary Clinton begins her second quest for the White House, the foundation has once again decided to limit governmental contributions, this time to a handful of Western democratic nations. Given the problems it has had in following its own rules, this might not be enough. If she really wants to be president, she needs to put the foundation’s work on ice during her campaign. That would eliminate the appearance of a back channel to the corridors of power. It would also help establish whether the foundation’s donors are more interested in addressing social problems, or cozying up to the Clintons. They are right in the criticism of the actions of Bill and Hillary Clinton earlier in their editorial, and that it is not possible for them to ethically continue to solicit contributions for their Foundation while Hillary is a candidate for president (or when she is president). They are incorrect that only the Clintons are blind to this. Many Democrats, who would be outraged by such conduct from Republicans, are ignoring this behavior from the Clintons. David Siriota wrote at Salon about the hypocrisy of those on the left who oppose the abuses allowed by the Citizens United decision while ignoring Hillary Clinton’s behavior.